New Account Ordering Demo Webinar Recording from Fisdap on Vimeo. As you know, we've been busy making lots of improvements to the Fisdap software. This time, we tackled our Account Ordering process. See what's changed and preview cool new features such as setting up your students' accounts for them or letting Fisdap email your students with their serial numbers. Just one more way Fisdap can save you time in your busy day! 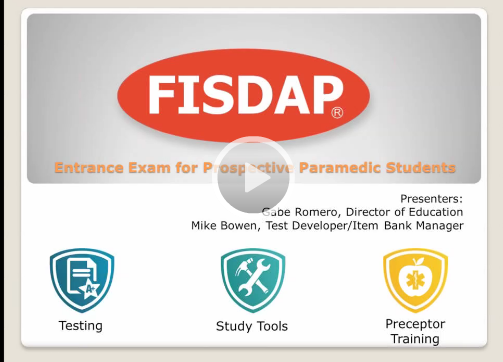 Check out the recording of our July webinar for information about how and why we built our first ever Entrance Exam. Skills Tracker 2.0 is previewed by Genghis and Louise in this month's Webinar! David Page stopped by to discuss the NREMT Psychomotor pilot and its implications for your program. Genghis and Mike, the customer support front line, answer questions from the Fisdap community. This webinar features a more in depth look at Testing, including an explanation of cut scores by our psychometrician, Nate Thompson. This webinar discusses all of the different reports FISDAP offers for checking up on your students' progress and making sure they are getting credit for the data they are entering into our system.